I’ve noticed some really nice mosaics on flickr lately, and thought I’d give it a whirl. These are four of my favorite “pastels” from some very talented photographers. Just click on the links under the collage and you’ll see their flickr pages. If you’d like to make your own mosaic, go to bighugelabs.com and follow their instructions. 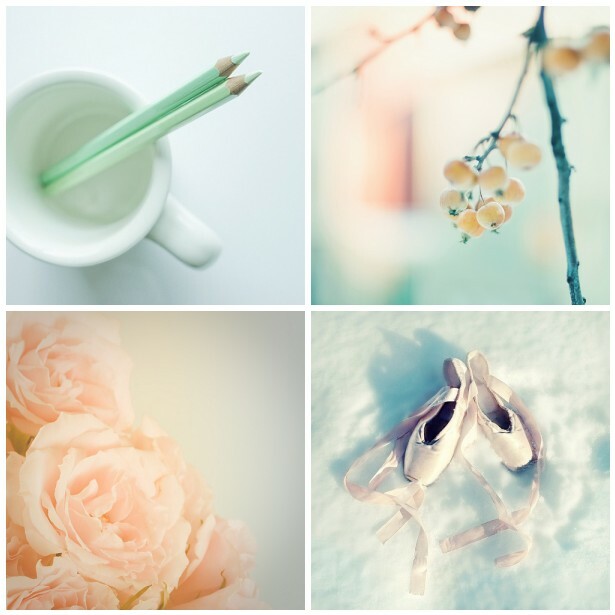 This entry was posted in photography and tagged berries, mint green pencils, pastel colors, pink ballet shoes, snow, soft pink roses, white mug. Bookmark the permalink. Did you get the snow last night/this morning? I heard that was WordPress. A very nice choice…Wouldn’t even know which one I prefer… The snow was nice… Are they ever doing other things during the seasons, like petals in spring…? Hopefully, you’ll see this as a compliment: These shots like straight out of Martha Stewart living. Gorgeous! I photos and the quiet gentle tones. They look like they should be in a relaxing retreat somewhere. Just beautiful together and as they stand alone.